The Hobbit: The Battle of the Five Armies is the third and final film in The Hobbit trilogy based off the beloved, same-named novel by J.R.R. Tolkein, following 2012s An Unexpected Journey and last year’s The Desolation of Smaug. When including the blockbuster Lord of the Rings trilogy that The Hobbit serves as a prequel to, this film completes director Peter Jackson’s monumental, six-movie, epic fantasy saga. Being an enormous fan of the Middle Earth films, I was absolutely ecstatic to finally see The Battle of the Five Armies. Heading into a packed premier, the series’ five other movies all found themselves extremely high up on my all-time favorites list. I can now say that I have had added yet another film to that prestigious group, completing my favorite movie series ever and perhaps the greatest saga in the history of cinema. The Hobbit: The Battle of the Five Armies is easily on par with all of its predecessors and even better than them in several different ways. 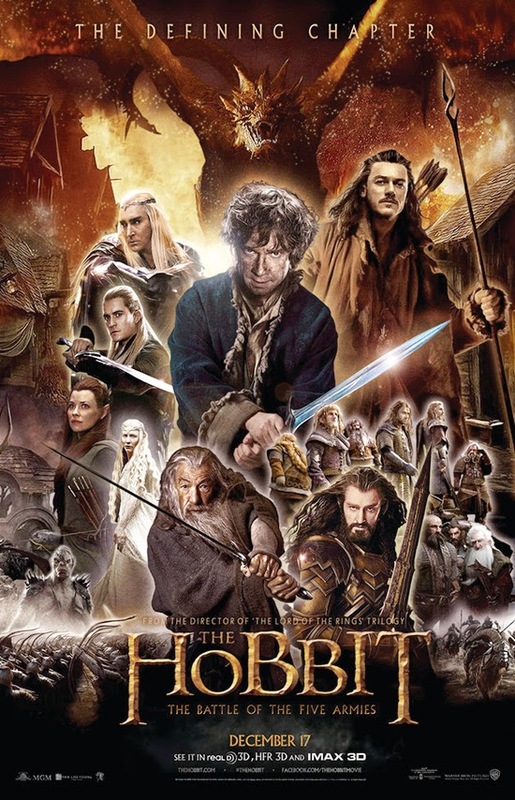 Picking up right after the cliffhanger ending to The Desolation of Smaug, this movie opens up with the incineration of Laketown by the devastating dragon Smaug (Benedict Cumberbatch). Although Laketown is completely destroyed in the end, local fisherman Bard (Luke Evans) manages to slay the beast. Meanwhile, the thirteen dwarves, along with title character Bilbo Baggins (Martin Freeman) reunite at the nearby Lonely Mountain and finally reclaim their beloved homeland. However, the mountain contains countless treasures of unprecedented value and all the beings of Middle Earth desire some of the wealth. This soon leads to the massive war clearly described in the title that takes up the majority of the movie. The Battle of the Five Armies is by far the most action packed and exciting film in the franchise. The many massive battle scenes are truly mind-blowing, containing breathtaking visual effects and unbelievable action sequences. On top of that, this film manages to perfectly conclude an epic trilogy while also connecting it directly to the beloved Lord of the Rings movies. Add an awesome soundtrack and completely phenomenal acting; what more could you ask for from this final chapter? As a massive Middle-Earth fan, The Battle of the Five Armies is my favorite of The Hobbit trilogy, one of the greatest in the six-movie saga and easily the best film of 2014.